V – The Victorian Hotel – Vancouver – When A Historic Hotel Becomes a New Asset for a Community. I hope you have enjoyed this year’s theme. I invite you to continue FOLLOWING this blog that will revert to things you would expect a writer and gardener, addicted to books and reading, to post. I would hate to lose your company. Cheers! This goldrush-era building in Vancouver is the Hotel Victorian. It is a perfect example for my #Challenge theme this year. I started by telling the story of the restoration of the Poinsett Hotel in Charlotte, NC, critical to the revitalization of the core downtown historic area. A version of The Victorian is what every city wishes they had; a piece of history to build upon. 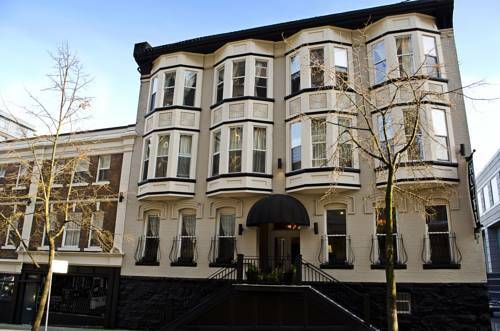 Situated on the corner of Homer and Pender, built in 1898, the Victorian was a truly grand structure. It had the largest and most impressive rooms on the ground floor rather than the upper floors, since elevators were not yet commonplace. Wealthy guests preferred to avoid climbing the stairs. Current owners have restored the hotel to its former glory. It has undergone extensive renovations including impressive work on the building’s exterior and a refurbished first-floor retail space that will include stores and a restaurant. The Victorian is of interest to visitors to the city interested in historic architecture.The hotel had a period of decline in the 1970s and ‘80s, but perhaps that period was a blessing in disguise. Original features still survive in the hotel that might otherwise have been torn-out and replaced. You will find original sinks, radiators and interior mouldings, now lovingly restored. You may remember that I wrote that The Poinsett Hotel was neglected for over twenty years. 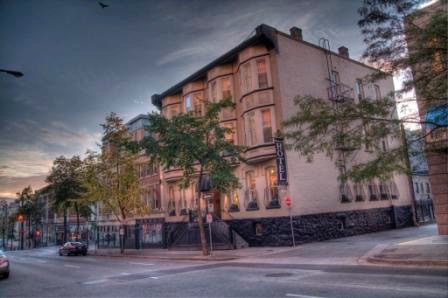 Today, The Victorian Hotel is a unique Vancouver property that highlights the best of its locale. Within the brick facade of this historic building are open spaces inspired by high-ceilings and solidity of past century construction. There are two buildings; the first and central building, Victoria, was built in 1898 at the time of the great Gold Rush. Built to house prospectors, explorers, and new comers searching for gold in wild and rugged British Columbia. The second building, Victoria Block, was built in 1908 in only five months to house the numerous real estate offices for the turn of the century real estate boom. Boutique hotels (100 rooms or less) began appearing in the 1980’s with New York at its epicenter. Often found in the slightly offbeat, but still highly sought after neighborhoods in urban centers, boutique hotels can be characterized as unique, stylish, and intimate. Yaletown and Gastown, where The Victorian Hotel is located, are two of Vancouver’s hippest areas. The Waterfront Skytrain station is only 3.5 blocks away. The Hotel is less than a block from one of the city’s main bicycle routes, providing a safe continuous path for visitors to explore a variety of Vancouver’s neighborhoods. PERFECT example of how a historic building becomes a new asset to a community adding to a sense of place people are looking for when selecting a place to live today. This entry was posted in A to Z Blog Challenge April 2016 and tagged The Victorian Hotel. Bookmark the permalink. 7 Responses to V – The Victorian Hotel – Vancouver – When A Historic Hotel Becomes a New Asset for a Community. Hi Stepheny, thanks for your visit, I enjoyed looking back over your posts. I think the Jefferson is the one for me. wowee- yet another grand old place! Hey! Thanks for visiting me! I like your hotels and inns theme. I haven’t stayed at any of the places you have mentioned in the challenge but I have experienced some great modern/vintage hotels in Rome, Thailand, and Malaysia. Looking forward to following you throughout A to Z. Thanks Meg. It has been an interesting theme to research and write. It takes some thought in picking a theme, which i prefer to do in order to stay focused. The dilemma is, will it interest others? I have looked at so many blogs during the #Challenge, and recognized some bad choices that would have been better to write about about another time, but not when you are trying to attract new readership that are on the run blog hopping. I understand even better now how important that early decision is. Let’s keep visiting beyond April. Cheers.